Defining a project accurately is critical to its success. Sometimes this isn’t an easy task, particularly at the beginning of any project: Small deviations at the start can have exponential negative effects later on. 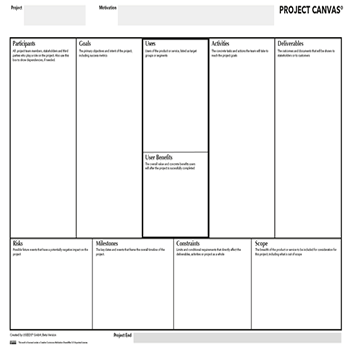 This canvas template presents a tool to help you visualize your project and develop a shared vision with all participants of e.g. scope, goal, milestones and deliverables: The Project Canvas (created by Jim Kalbach of USEEDS GmbH). If you want to try it out without entering your email address, please use our public Project Canvas Demo for a first impression. – We believe users stand at the center of attention in every project. Accordingly, we’ve put “Users” in the center of the canvas. At a minimum, list here the main target groups relevant to the project. This can be at a high level, such as “readers” and “advertisers” for a media portal. You may want to be even more granular in detail. For instance, you can list personas you’ve developed here, as well. – List the concrete benefits that users will have when the project is successfully completed. What will they gain from it? This can include things like “faster check-out times” or “more control over their own content” and so forth. – To the left of users is a region for project goals. You can also map success metrics to each goal in this box. Include subheaders in this box to distinguish different types of information. – On the far left is a list of project participants. This should include all people involved in the project in some way. We tend to have several lists of participants by type, such as “core team,” ”stakeholders” and “interested parties.” Include individual names as much as possible. Optional: in the lower half of this box you can show dependencies. For instance, if prototypers are depended on getting content from a client, that should be made explicit. – To the right of “Users” is a list of key activities. These are the methods and approaches you’ll be employing on the project. Examples include “User research,” “Persona development,” “Concept design,” “Wireframing,” “Creation of detailed mock-ups” and “User testing,” to name just a few design-related activities. – List the documents that will be delivered. This doesn’t need to include internal working documents, like spreadsheets and analysis documents. It should only include things stakeholders or other teams will see, as well as assets that appear in a product or service that customers may see. – This is a list of potential future events that can have a negative impact on the project. For instance, recruiting users for testing may be a risk for target groups that are difficult to get to: in this case the impact would be slippage in testing timelines or a reduced sample size. You can also list how you might mitigate known risks here. – List the key dates and events that frame the overall timeline of the project. This doesn’t need to be a detailed project plan. It should include things like “workshop with senior management,” “user testing sessions” and a launch date. – Time and money are always constraints, and you need not list them here. Resources are also a typical constraint, so only list exceptional resource constraints. The focus should be on overarching limitations on work products and processes. For design, this may be something like: “the designs must comply with the CI guidelines.” Include technology and platform constraints here as well. For instance, if a website needs to work on an iPad and smartphone, you’ll want to know about it from the very beginning. – Finally, define the scope of the project. List the features and functions that are in consideration on the project. Also list what is NOT in scope here, if known. Information in this box is helpful in fighting scope creep later on in the project.